Silver toned Charm Bracelet is a great way to show your excitement when expecting a baby. 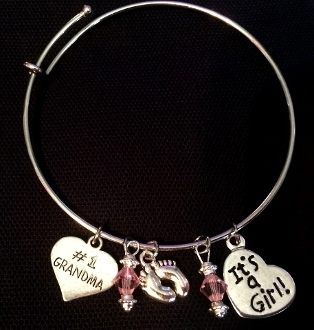 This bracelet would also make a great way to tell a family member your are expecting, to reveal the gender, or announce the birth of your new baby. You choose the color for the jewel beads and choose from several different charms. It come with It's a Girl or It's a Boy charm and two colored beads of your choice. You also choose two other charms that are included in the price and you have the option of adding 3 more charms for $2.00 each. The charms include #1 Grandma charm, Proud Mom charm, a Heart charm for other relatives, a Hope charm, a Love charm, and a Joy charm. The beads are pink, lavender, yellow, blue or Green. This piece is beautiful. The pictures do not do the jewelry items justice. And it has FREE Shipping! If it is a gift I will gift wrap it for free. Just add a note in the special instructions of what you would like. PLease also add any information I need as far as approximate date it needs to be delivered. They are shipped Free through the postal service so dates are approximate. Also please include your phone number in the special instructions.